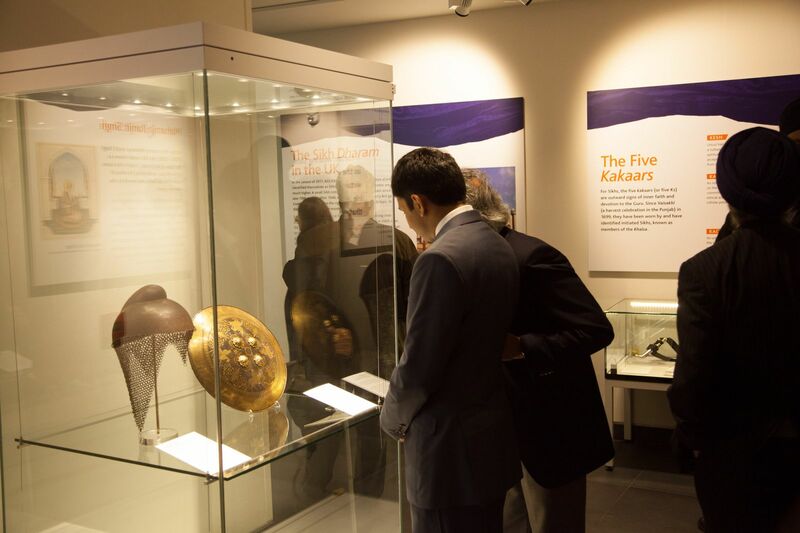 The Nishkam Centre teamed up with Birmingham Museum and Art Gallery (BMAG) to exhibit the Sikh Fortress Dastar (turban), worn by the warrior Sikhs called the ‘Akali Nihangs’. The exhibition, which is on display at the museum from 26 January to 28 April 2013, gives visitors a rare chance to explore its story and learn more about the Sikh faith. The Dastar (turban) is on loan from the British Museum, where the original Sikh Fortress Turban has been in its collection, since the early twentieth century. In the 1900 it was displayed at the Banqueting House, Westminster as part of a ‘Relics of Old Wars’ exhibition. Whilst the self-defence weapons contained on the Turban are original the fabric has been entirely restored and replaced. The exhibition has proven to be a great opportunity for local people and organisations to work together in creating a resource which will raise awareness, break down barriers and also build new and exciting partnerships for future collaborations. An important aspect of the project is to ensure that local communities in Birmingham played an integral part in the development of the exhibition. Contributions from local schools and communities included quotes, interviews, workshops and a short film all exploring the journey of the Dastar and why the Dastar is an integral part of the Sikhs. Speaking at the launch of the exhibition, Project Coordinator at the Nishkam Centre, Kiran Kaur said: “We are thrilled to be collaborating with BMAG and the British Museum to make this exhibition happen. All museums have a responsibility of keeping history alive and the Nishkam Centre is passionate about ensure communities preserve and share their rich heritage. There couldn’t have been a better partnership of passionate organisations coming together to create something beautiful. This was a fantastic opportunity for the Nishkam Centre, Sangat Television and BMAG to bring an exhibition to Birmingham for all to enjoy. The Sikh Fortress Dastar was used to protect the head in battle. The tall conical structure of the turban is like that of a tower or fortress. This made it effective in battle, protecting both the head and the revered hair of the Sikhs from sword blows. The Dastar is tied by entwining the long hair with the turban cloth which can be up to 20 yards long. Self- defence weapons were secured to it by winding long lengths of plaited steel around the turban to provide further protection. Some Akali Nihangs still wear this type of turban today as a symbolic representation of the tradition. The Nishkam Civic Association, more fondly known as the Nishkam Centre is one of the five Centres for Excellence created by the faith-based charity, Guru Nanak Nishkam Sewak Jatha. Chaired by Bhai Sahib Dr. Mohinder Singh Ahluwalia, who holds two honorary degrees from the city’s universities, it aims to serve and uplift society through the practice of core values – nishkamta, or the spirit of selflessness, being one of them. Inspired by spirituality, the organisation has generated a flourishing culture of volunteering, which has contributed immensely to transform its visionary projects into a reality.